The fascinating life of Queen Isabella of France and her marriage to England's King Edward II is spectacularly portrayed in N. Gemini Sasson’s newest novel, Isabeau. This riveting story sweeps the reader into the turbulence of 14th century England, Scotland, and France with passion and detailed historical fact. From the earliest days of her marriage to Edward, Isabeau learns she must compete for her husband's attentions. Piers Gaveston is her husband's favourite, his lover; a peacock of a man whom Edward showers with gifts of vast wealth. Edward's incompetence on the throne of England is evident to everyone. His apparent attentions to Piers angers politicians and leaders. As the misguided Edwards errs in his political judgements, Isabeau attempts to guide her husband. Not only beautiful, but highly intelligent with sharp diplomatic skills, Isabeau attempts to influence Edward's decisions to keep tensions both within and outside of England to a minimum, but it proves to be a daunting task. Edward, however, is not so easily influenced and as time passes, matters worsen for him. His unpopularity reaches new heights. The attentions he lavishes upon Piers Gaveston ires his countrymen and soon Piers is executed. Isabeau is hopeful that perhaps now, her husband will turn his attentions back to her. It was not to be. Before long, she learns her husband has taken a new lover - Hugh Despenser, a dangerous, ambitious man who will stop at nothing to wield his influence and destroy Isabeau whom he sees as his enemy. Isabeau's plight increases as Hugh Despenser manipulates Edward's every action. Isabeau finds herself separated by her children and sent to France to negotiate on her husband's behalf. It is in France that she reunites with Sir Roger Mortimer, a man she saved from the Tower several years earlier. Unable to deny their love for each other, the two enter into a dangerous liaison that will take them back to the shores of England where Isabelle leads an army to recapture the country on behalf of her son, Edward III. 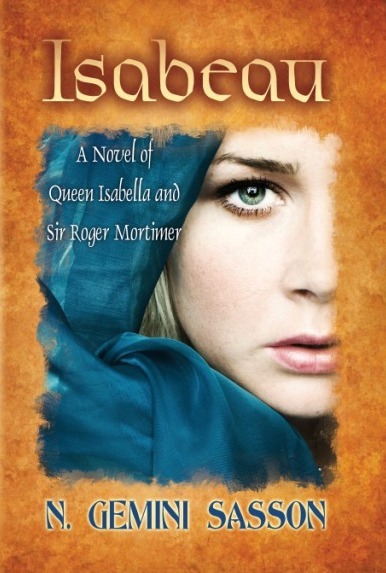 From start to finish, the novel, Isabeau, kept me turning its pages. Lulled by the beautiful prose and stunning descriptions, N. Gemini Sasson breathed life into the woman known as the She-Wolf and portrayed her with sensitivity and great humanity. As I made my way through the story, I was impressed by Sasson's descriptions of people and places. Every detail of every scene was written with clarity, activating all the reader's senses. The novel spans nearly twenty years of her life and includes numerous characters of the era. The fact that the author has spent years researching English and Scottish history during this time is evident. For anyone who loves European history or biographical novels about influential women of days of yore, you must read this novel. It will bring you hours of reading pleasure. I guarantee it.